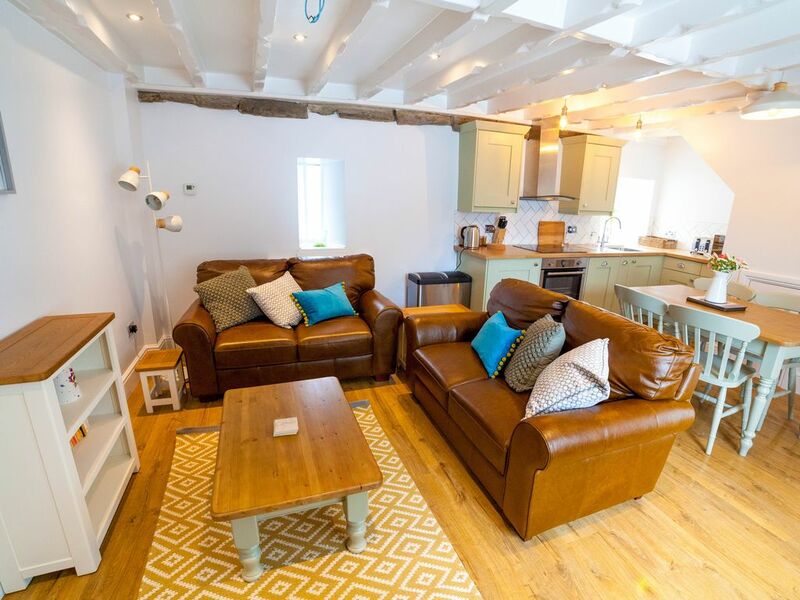 Colby cottage is set in 10 acres of rolling grounds which have wonderful sea views of both Manorbier and Skrinkle bay. A short walk through the meadow will bring you within a stones throw of the village of Manorbier where you can find an excellent shop, handy post office, relaxed pub and delightful tea rooms including a beautiful seaside gift shop. Manorbier is a village with a wealth history, also featuring a beautiful castle with spectacular views of the bay, a picturesque church and not forgetting the stunning, secluded beach with parking in walking distance. The cottage is named after the peaceful woodland gardens of Colby. It encaptures the calmness of the woodland environment, with thoughtfully collected features, locally sourced art and decorations. It is a centrally heated 2 bedroom barn conversion with an open plan lounge, kitchen and dining area. There is an enclosed, gated, beautiful garden with patio, furniture and barbeque to the front of the property. Entrance is into a welcoming hallway with a door leading off to the lounge and kitchen. The newly fitted kitchen is well equipped with electric oven and hob, fridge/freezer, microwave and slim line dishwasher. A cosy lounge with TV (freeview) and DVD has views out onto the garden area. Two double bedrooms one with double bed and one with a full sized single bed and a full sized single built-in raised bed, all with excellent quality bed linen provided and made up for your arrival. The Family bathroom has an elegant drench shower, toilet, sink and heated towel rail. The whole cottage has been thoughtfully redecorated and designed this year (2018) to create an idyllic hideaway. We had a great stay- the cottage was really nicely done- not one thing I could fault- enough space for four adults. Great location- scenic short walk to Manorbier with nice pubs, castle and beach. 8 minute drive to Tenby and also very close to beautiful beaches and the costal path. 10/10 trip! I would definitely recommend and stay again. Wyndmill Hill was a fantastically located cottage with all requirements necessary for a home-from-home stay, plus thoughtful extras in the welcome basket such as the freshly-laid eggs. Our hosts were considerate and helpful and the cottage itself plenty big enough for us and our 14 and 10 year old children. We loved that we could walk to local attractions, so we’re not reliant on the car. But also that we were only a few minutes away from a wide range of sites of interest. We especially enjoyed Tenby and the local beaches. If in Tenby, the Malaysian curry from the market hall was delicious. The coffee and ice-cream from the harbour side cafe, tucked into one of the little sheds, was excellent. A walk to Skrinkle was great fun and the lakes at Bosherton and on to Broadhaven beach was spectacular (bring a hat; it was windy in April!). Overall, a very enjoyable few days where we could all relax and recharge on the beautiful Pembrokeshire coastline. Colby cottage was one of the most comfortable cottages that we’ve stayed in by far. It is set in a beautiful area surrounded by countryside and beaches that are breathtaking, all within easy reach by foot or car. The cottage itself was very comfortable and felt like home from home, my husband and I stayed for a week and we could have stayed longer it was so relaxing. Our hosts were very welcoming and very helpful advising us of places to visit. All in all I wouldn’t hesitate to visit Colby cottage again. Thanks to Llinos and Russel for making our holiday so memorable. Thank you so much for taking the time to write such a lovely review Jackie! I was a pleasure having you both to stay and it means to much to us to hear you’ve enjoyed yourselves. Our weekend experience of Colby cottage was extremely positive. We are only sorry we couldn't stay longer! It is perfectly designed, spotless, warm and comfortable. Our daughter loved the bed with little "den" underneath and we loved the contemporary country feel and lovely shower room. Llinos and Russell were professional, helpful and friendly. The cottage is in a great location close to Manobier village, castle and beach and an easy drive to Tenby. We would definitely enjoy staying there again if holidaying in the area and wouldn't hesitate to recommend it :-) Thank you Llinos and Russell! Thank you Julie for taking the time to write such a lovely review. It's so lovely to hear you all enjoyed your stay, we hope you'll get to visit us again soon and for a little longer next time. Outstanding property in a superb location. Before our arrival the communication with the owner was excellent with all questions answered promptly. The property was easy to find and in an excellent location between Tenby and Pembroke. On arrival we had been allocated the middle cottage for our stay. A welcome basket was on the table with some snacks, tea bags, coffee and milk, very nice touch. The property was superb with excellent decor and everything you need in a home from home. The ground floor comprises of an open plan living room with large TV and kitchen diner which is well equipped. There is a dining room table and a good selections of utensils if you decide to cook for yourselves and a full size oven and hob as well as a microwave oven, toaster and kettle. On the first floor there are two well appointed bedrooms. One with twin beds and one double. The bathroom has an excellent corner shower and is well appointed. Our visit was in February and we spent our days exploring the Pembrokeshire coastline so it was nice to return to a warm and cosy cottage at the end of each day to relax and unwind. The town of Manorbier is a short walk through the garden and meadow (take a torch or use the torches from the cottage) in town there is a small well stocked convenience store, a pub which serves food and a tea room. The owners were very helpful with some great advice on areas to visit and nothing was too much trouble. Overall we thoroughly enjoyed our stay and look forward to returning soon. Thank you for your kind review David, we really appreciate you sharing your positive experience and are so glad you enjoyed staying with us. Please note change over days are only Monday and Friday out of peak season.